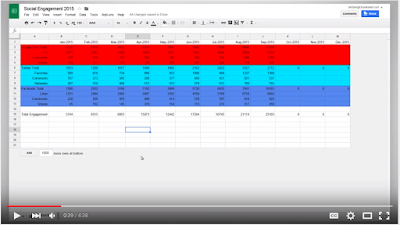 Below is an excellent video tutorial from Google for Work in which John and Debbie explain how to use the new Google Sheets features. As you probably know, Google has recently added a number of powerful new functionalities to Sheets allowing users to do more with their spreadsheets. Two main features are reviewed in this tutorial: Explore and Templates. Here is a quick overview of these features from Google Docs Help page. Open a spreadsheet. If you want to see information for a specific portion of your data, select a range of cells. Otherwise, you will get insights based on where your cursor is. In the bottom right, look for the Explore icon . If the icon is green, click it to see recommendations and tips. If the icon is gray, there is no analysis to see at the moment. Charts and analysis will appear, showing trends and patterns from the data in your spreadsheet. Hover over a chart to see which data in the spreadsheet is being used in the chart. You can continue to see more recommendations by selecting different parts of your data. To close the Explore panel, click the X in the top right corner. To add a chart or formula from the Explore panel to your spreadsheet, you can drag the chart or formula into your spreadsheet. You can also add a chart by clicking the Insert chart icon . Note: You can only add a chart or formula to a spreadsheet if you have permission to edit the file. 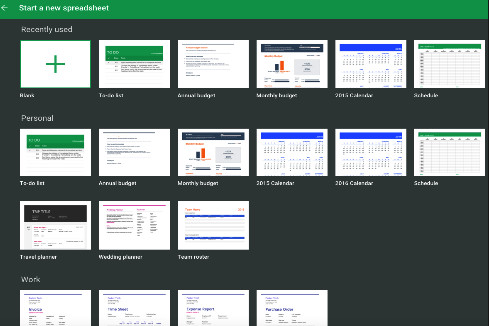 You can now select from a number of pre-designed templates to use with your Sheets. These templates are arranged into four main categories: recently used, personal, work, and education. To access the templates gallery click on sheets.google.com then select one of the featured templates at the top of the page. Or, to see all of the templates, click More in the top right.